R18000-XOWS is rated 3.7 out of 5 by 3. Rated 5 out of 5 by Paul L from Its in the details! The quality of this product is worth every penny! Its solid cast and machined for a precise fit. You can sweat directly to it without the fear of damaging seals or valves. All of the internal valves are installed after the rough in stage. Another nice feature are temporary test plugs that are installed so you can pressurize the system and check for leaks. 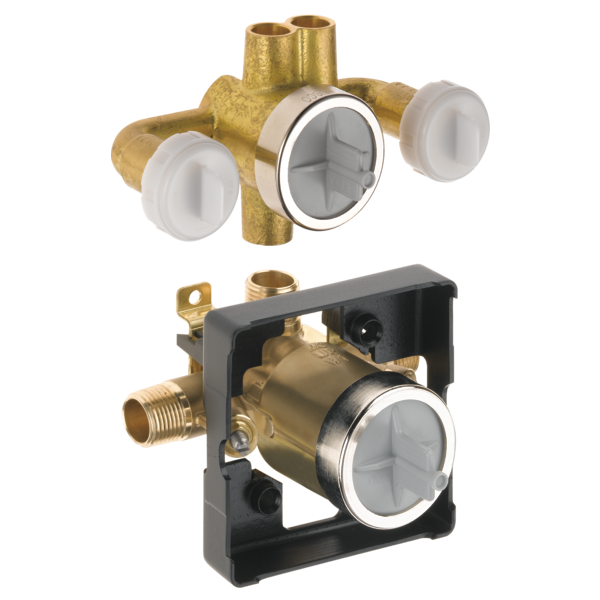 Leave these in place until you are ready to install the valves and trims. It will keep any dust & dirt out. Rated 1 out of 5 by Kcyocum from Rough valve body and 6way valve The template enclosed with the rough valve and jetted spray-six valve is useless and will even mislead you. The template calls for two inch separation between mixer valve and selector valve. When you do this the cover plate for the lower valve intrudes into the space for the cover and body spray escutcheon unit..I had to open wall and separate these two valves. A real aggravation in loss of time ans expense. like the old model 1825. what do I need to order now to get the single pair of jets for a jetted shower. when I did the wizard it came up with 2 model numbers but the price was so low, they said I did not have enough part numbers for what I was talking about. the models numbers I have are t14292 &amp; r1800. please help. I have the Model#: T18255-PTXO. The handle parts corroded and I have to replace the cartridge and valve. Unfortunately the T18255-PTXO is discontinued. Can I use the handle, cartridge, and R10000-UNBX valve from the 1755RB-716RB kit? What is the max flow rate? On the jetted diverter assembly, should the face of the two jet outlets be flush with the tile or do they need to stick out farther then that? On the universal valve assembly, I assume the plastergard provided should be flush with the tile? Rough-in valve and trim for 58467 In2ition shower head? Is this the correct Rough-in Valve for a 58467 In2ition shower head? And where do you list the trim for this? Thank you. I want to install a hand shower along with this jetted shower valve, do I need a diverter as well? I want to install T-17278-RBH2O and 57021-RB along with the jet model T18037-RBXO. Do I need to purchase a separate diverter and trim to operate the hand shower? If not, what will control the operation of the hand shower? Will this run continuously?